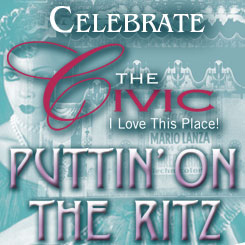 Come to the Akron Civic Theatre Fundraiser – Puttin on the Ritz and step back into time, where the “Speak Easys” were the place to be. Casinos, Bath-Tub Gin, Hotsy Totsys and The Big Cheese were all part of the scenery. Live Auctions with autographed merchandise from Bill Cosby, The Temptations, George Jones, Lyle Lovett and John Hiatt, George Jones, Gabriel Iglesias and many more! Don’t miss the opportunity to be the Cat’s Pajamas! This entry was posted in akron, Art News, arts, music, ohio, shows, theatre and tagged akron, civic, music, ohio, theater, theatre. Bookmark the permalink.